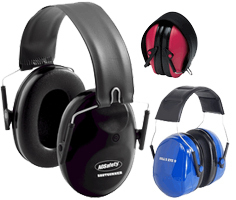 Ear muffs are the hearing protective devices (HPDs) most preferred by shooters. Although earplugs are generally more effective and less cumbersome than ear muffs for shooters, the ear muffs are easily removed between rounds and they can readily be seen to be in place, which makes rule enforcement easier on shooting ranges. Any noise protection ear muffs can be used to protect against the sounds of gunfire, but the models listed below are made specifically for shooters. These tend to be shaped for less interference with the gun stock when shooting, and/or with a higher rating to deal with the extreme noise conditions frequently encountered in shooting, especially when shooting big-bore weapons. TIP: For the highest noise protection available, use dual protection, that is a highly rated earplug (NRR 29+) worn at the same time under a highly rated ear muff (NRR 30+). This combination will give you the greatest noise protection available at any price. (NRR 30) Top of the line passive ear muffs from Pro Ears. These comfortable non-electric ear muffs offer some of the the best protection from dangerous sound you can get in any ear muff. (NRR 30) Soft foam ear cups pivot independently on the wide, padded headband for a comfortable fit and tight protective seal. (NRR 25) AOSafety Bulls-Eye 9 headband model ear muffs are a lightweight ear muff with standard ear cups. (NRR 19) Rifleman Folding Ear Muffs fit babies through adults and offer a very economical choice in folding earmuffs, for all moderate noise applications including concerts, motorsports and small caliber shooting.